When Realtors tell you the three most important features of a house are location, location, location, this is what they mean: This listing is in the historic Bayou St. John neighborhood, within walking distance to the Fairgrounds, Jazz Fest and City Park. The house has a wide front porch with white columns marching smartly across. The exterior is pale yellow and it’s surrounded by a wrought iron fence and mature plantings. The back patio is all brick with plenty of ferns and shade trees and is perfect for morning coffee, entertaining friends after Jazz Fest or just resting and relaxing. The center hall leads to the living room with views of Esplanade Avenue and it has its own chandelier and fireplace. The dining room has a distinctive chandelier as well. The rooms have high ceilings, triple-crown molding, beautiful wooden floors and pocket doors. The kitchen has granite counter tops, an eat-on island that seats three and plenty of storage and light. A wrought iron railing is on a staircase leading upstairs. The master suite on the second floor opens onto a charming balcony. 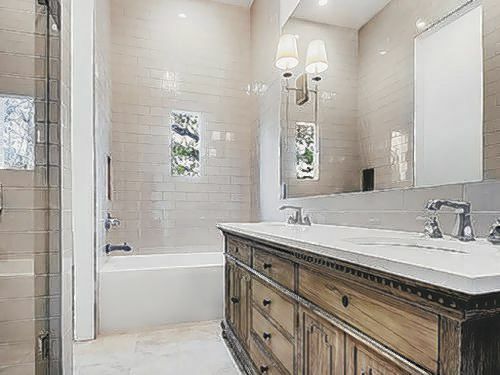 The baths have plenty of light and have marble floors and counter tops. City Park is 1,300 acres formed in 1854, making it one of the nation’s oldest urban parks. Each year, millions of visitors stroll under the same historic oaks and picturesque moss canopies that served as the backdrop for dances, concerts and even gentlemanly duels. Today’s City Park offers something for everyone: Roses in the Botanical Garden, art in the Besthoff Sculpture Garden, the sprawling green spaces of the park’s biking, jogging, and walking paths, 26 tennis courts and the 18-hole golf course. The park also offers an antique wooden carousel in the Carousel Gardens Amusement Park. The crown jewel of City Park is the world’s largest stand of mature live oaks, which includes a grand oak that dates back nearly 800 years. The portage trail used by the Indians along Bayou St. John eventually was replaced by the wide, straight Esplanade Avenue. After the Louisiana Purchase in 1803, the Carondelet Canal was dug to connect the back of the city with the bayou, and the bayou was dredged to accommodate larger vessels. In the 19th century, an area along Bayou St. John was reputedly the location of many voodoorituals by Marie Laveau. The Magnolia Bridge over the Bayou continues to serve as a site for such rituals every St. John’s Eve. During the first half of the 20th century, the Carondelet Canal was filled in, a Works Progress Administration project cleaned up and beautified the area and a lock was installed near the Lake Pontchartrain end. Since then, the Bayou has been a picturesque body of water with small earthen levees on either side, forming a narrow park space in the city. The banks of Bayou St. John are an important meeting place for the downtown Mardi Gras Indian tribes for their Super Sunday parade. as gated parking for two cars.